South Padre Island, Texas is a wonderful place to "pop the question"... Sandy Feet Sand Castle Services can help make sure she says "yes!" We can incorporate ring boxes and any other props into the sculpture, including scattered rose petals or a strategically hidden bottle of champagne. We can shoot pictures of the special moment for you - with your camera or ours. Don't see exactly what you want here? Do some googling, send us the link, and we will do our best to duplicate it. For additional fees we can incorporate names of blended family members; special objects or design flourishes with special meaning, etc. We can even do the sculpture when you aren't here! We will build the sculpture to your specs; shoot high-quality photos and send you the digital file. You can print it, frame it or post it anywhere you want on the web. 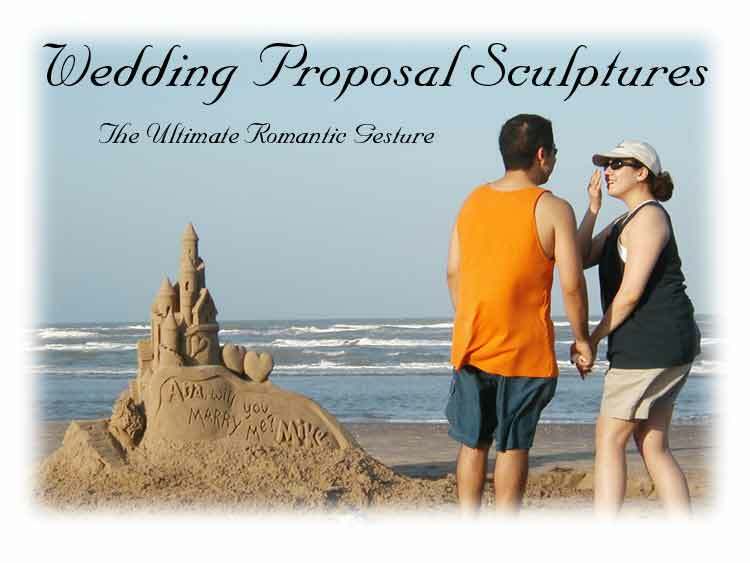 Here's a fun suggestion for a proposal sculpture: Hire us to teach you and your intended how to build a sandcastle. By the end of the session, you have a pretty castle that you helped build with a surprise "marry me" message that YOU carved! Tre Romantico! We also do beach wedding sculptures!